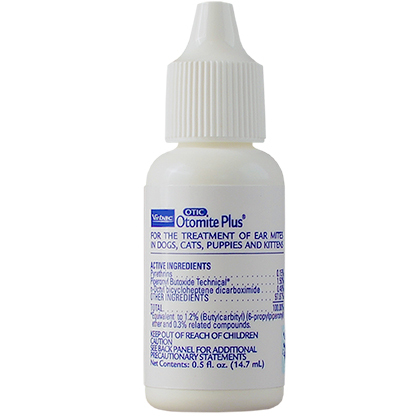 Otomite Plus eliminates ear mites from your cat or dog without irritation. The gentle, safe, effective and cost-efficient formula contains the highest levels of synergized pyrethrins available to rid your pet of the contagious parasite. Harmful to humans and pets if swallowed. Avoid contact with skin, eyes and clothing. Avoid breathing vapors. Keep out of reach of children. Pyrethrins (0.15%), Piperonyl Butoxide Technical (1.50%), N-octyl bicycloheptene dicarboximide (0.48%). Otomite Plus contains pyrethrin, a parasiticide that kills ear mites. Otomite Plus is a non-prescription (OTC) product. Shake well before using. Cleanse ear thoroughly with a low pH ear cleanser. Place sufficient Otomite Plus in each ear to wet external ear canal, approximately at the rates of 1 drop per body weight for dogs (maximum 15), and 2 drops per pound of body weight for cats (maximum 10). Spread product inside ear canal by massaging the ear. Re-treat at least every 7 days, depending on the severity of the condition, but not more frequently than twice a week. If the condition does not resolve in 2 weeks, discontinue treatment and consult your veterinarian. If it is necessary to reuse an ear cleanser, re-treat with Otomite Plus. Sensitivities may occur after using any parasiticide product for pets. If signs of sensitivity occur, discontinue use and consult a veterinarian immediately. HAZARDS TO HUMANS: Harmful if absorbed through the skin. Avoid contact with skin or clothing. Prolonged or frequently repeated skin contact may cause allergic reactions in some individuals. Avoid contamination of feed and foodstuffs. HAZARDS TO DOMESTIC ANIMALS: FOR USE ON DOGS AND PUPPIES, CATS AND KITTENS ONLY. Do not apply to pets less than 12 weeks old. Consult a veterinarian before using this product on medicated, debilitated, aged, pregnant or nursing animals. Sensitivities may occur after using ANY pesticide product on pets. If signs of sensitivity occur, bathe your pet with mild soap and rinse with large amounts of water. If signs continue, consult your veterinarian immediately. FIRST AID: If in eyes: Hold the eye open and rinse slowly and gently with water for 15-20 minutes. Remove contact lenses, if present, after the first 5 minutes, then continue rinsing eyes. Call a poison control center or doctor for treatment advice. If on Skin or Clothing: Take off contaminated clothing. Rinse skin immediately with plenty of water for 15-20 minutes. Call a poison control center or doctor for treatment advice. HOT LINE NUMBER: Have the product container or label with you when calling a poison control center or doctor, or going for treatment. You may also contact 1-800-345-4735 for emergency medical or veterinary treatment information. ENVIRONMENTAL HAZARDS: This product is toxic to aquatic organisms, including fish and invertebrates. Do not contaminate water when disposing of equipment, washwater, or rinsate. See Directions for Use for additional precautions and requirements. KEEP OUT OF REACH OF CHILDREN. Store in a cool, dry area. Do not contaminate water, food, or feed by storage and disposal. Place sufficient Otomite Plus in each ear to wet external ear canal, according to Dosage Chart below. Spread the product inside the ear canal by massaging the ear. Re-treat at least every 7 days, depending on the severity of the condition, but not more frequently than twice a week. If the condition does not resolve in 2 weeks, discontinue treatment and consult your veterinarian. If it is necessary to reuse an ear cleanser, re-treat afterwards with Otomite Plus. Do not reuse empty container. Wrap container and put in trash (do not pour down drain). Avoid breathing vapors. Wash hands thoroughly after handling. Place sufficient Otomite Plus in each ear to wet external ear canal, approximately 2 drops for each pound of body weight (maximum 10). Place sufficient Otomite Plus in each ear to wet external ear canal, approximately 1 drop for each pound of body weight (maximum 15). This product is toxic to aquatic organisms, including fish and invertebrates. Do not contaminate water when disposing of equipment, washwater, or rinsate. Do not contaminate water, food, or feed by storage and disposal. Pesticide Storage:KEEP OUT OF REACH OF CHILDREN.Store in a cool, dry area. Pesticide Disposal and Container Handling:Nonrefillable container. Do not reuse or refill this container.If empty:Place in trash or offer for recycling, if available. If partly filled:Call your local solid waste agency for disposal instructions. Never place unused product down any indoor or outdoor drain. * Equivalent to 1.2% (Butylcarbityl)(6-propylpiperonyl) ether and 0.3% related components.